Errrorless learning is one of the most studied principles in neurorehabilitation. This is the first volume to capture all the key elements in the field in one invaluable resource, providing an up-to-date and broad analysis of the use of errorless learning principles in rehabilitation after brain injury. 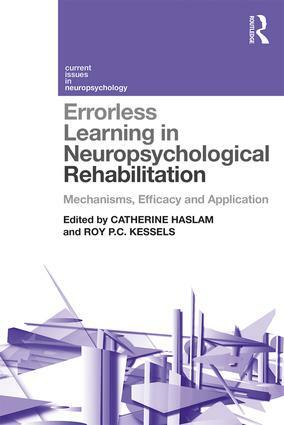 With contributions from key researchers in the field, Errorless Learning in Neuropsychological Rehabilitation covers the historical foundations of errorless learning, current understanding of underlying mechanisms which support learning and its use in memory and language in rehabilitation as applied to particular populations across the age span. This volume also addresses questions of efficacy through analysis of research comparing errorless learning with other established learning methods and principles. Errorless Learning in Neuropsychological Rehabilitation is an essential resource for practitioners, researchers and students of psychology, neuropsychology and rehabilitation. Catherine Haslam is Professor of Clinical Psychology at the University of Queensland, Australia. Roy P.C. Kessels is head of the Department of Neuropsychology and Rehabilitation Psychology and clinical neuropsychologist at the department of Medical Psychology, Radboud University, The Netherlands. Current Issues in Neuropsychology is a series of edited books that reflect the state-of-the-art in areas of current and emerging interest in the psychological study of brain damage, behaviour and cognition. Each volume is tightly focused on a particular topic. The editors of individual volumes are leading figures in their areas and provide an introductory overview, with chapters contributed by international experts. Each book will reflect an issue, area of uncertainty or controversy, with contributors providing a range of views on the central topic. Examples include the question of whether technology can enhance, support or replace impaired cognition, and how best to understand, assess and manage alcohol related brain damage.